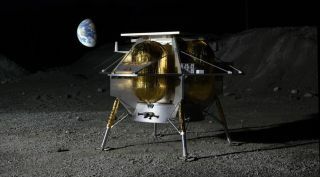 Companies like Astrobotic are developing small lunar landers that could be ready to fly by the end of the decade as part of a broader U.S. effort to return to the moon. PASADENA — NASA intends to begin buying rides on small commercial lunar landers by the end of the year and start looking for miniature instruments for those flights. "We have a strong push to get a lander service to the moon as quickly as possible," James Reuter, NASA deputy associate administrator for the Space Technology Mission Directorate, said May 24 at the Space Tech Expo here. "We think the capability is there in industry for us to do that." NASA released a draft Request for Proposals in April for the Commercial Lunar Payload Services program. Through the program, NASA intends to buy rides on landers capable of delivering ten kilograms to the lunar surface by the end of 2021. A final RFP will be issued this summer and "we intend to award by the end of the calendar year," Reuter said. "To make this work as a commercial service, we want to be a primary customer, but not the only customer," Reuter said. "That will be part of our decision-making. We are nominally thinking we will sponsor at least one flight a year." NASA also will look for payloads for the miniature landers in addition to landers capable of delivering 500 to 1,000 kilograms to the surface of the moon. "These landers are not necessarily commercial but we are interested in knowing of any business case out there," Reuter said. "We are thinking that if we go straight to a human-size lander now and impose the requirements that we typically impose on human-rated vehicles, we would probably develop something too unwieldy. Our goal is start with a mid-size lander, something 500 to 1,000 kilograms, and let industry develop that based on their standards to be highly reliable." Perhaps a commercial lander will evolve into a lander large enough to deliver people to the lunar surface, which Reuter estimates will be in the 5,000 to 6,000 kilogram range. As NASA explores industry plans for 500 to 1,000 kilogram landers, the agency will "probably" conduct its own lander studies, Reuter said.